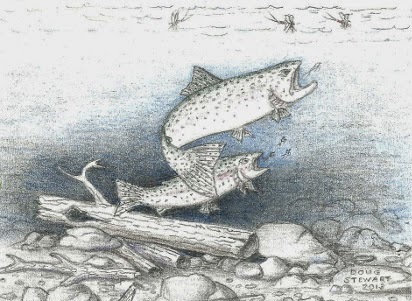 Many fly fishers are often unsuccessful because they fail to find out (1) what type of insect is hatching, (2) how trout are feeding on it and (3) what type of fly and presentation to use. If fly patterns are randomly selected and haphazardly cast, hooking fish becomes a matter of chance. However, if you understand rise types it will eliminate guesswork and enhance your chances of success. This can be done by studying fish activity under the water and near the surface. Close attention to rises is critical to fly selection. For example, a bulge occurs when fish porpoise and expose their arching back. This signifies that fish are probably taking nymphs or emergers just under the surface. If they’re taking nymphs, use a 9 foot leader and small #12 fly pattern and cast the fly above the intended target. Then let it deaddrift down to the fish’s location. For emergers, make the same type of cast, but as it drifts down retrieve the fly with short, steady strips.